Unfortunately, I agree…..felt very let down. Although, I thought Martin was particularly good. I still have hope. 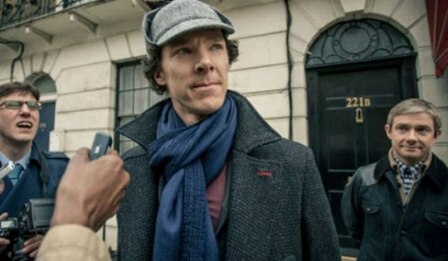 Sherlock did set a high standard for itself and I’m happy to give it a mulligan. Freeman was good. Cumberbatch was funny. Fingers crossed. I notice he’s less cheerful than his original, and more acerbic. Does it get any better? Might as well prepare myself now. not to my mind (but some say I’ve lost it). Let me know what you think please. I will. I have Episode 2 slotted for my mid-week post next week. I wish I had read the reviews first. I convinced my husband to watch with me and am sure he will not want to watch another for fear of another bloated, frantic, fairly pointless episode. Can you get him to watch Seasons 1 and 2? I’ve enjoyed rewatching them. I’ve avoided reading much out of the UK, which got the shows first, but the rumblings I’ve heard are preparing me to lower my expectations for the rest of Season 3.